Mozambique is a country rich in natural resources. Forests covers 51 percent of the country’s total surface area— or about 40 million hectares. 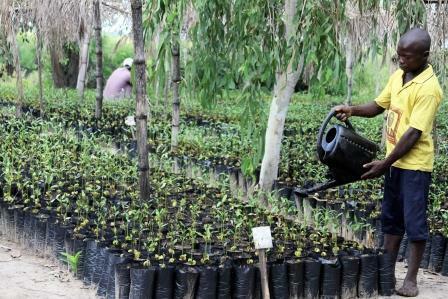 Mozambique’s tree-filled landscapes play an important part in its economy, contributing up to 4 percent a year to its Gross Domestic Product (GDP). However, today, the country suffers from rapid deforestation and estimates show it could lose around 138 mil hectares per year (0.23%) at current rates. This is mainly due to conversion of forested land into small-scaled agriculture, extraction of wood for household use, illegal logging, as well as urban expansion. What’s more, emissions from deforestation alone represent 80% of the total emissions for the country. The World Bank Group has been working closely with the government of Mozambique to fight this deforestation and forest degradation through different tools and interventions, one of which is known as REDD+ (which stands for reducing emissions for deforestation and forest degradation). The Bank’s Forest Carbon Partnership Facility has been working with the government on its REDD+ efforts since 2013, and over the past three years has specifically focused on supporting the country’s development of a national REDD+ strategy. In November, the Ministry of Land, Environment and Rural Development (MITADER) finalized and approved a comprehensive national REDD+ strategy for the country. The objective is to conserve Mozambique’s wooded areas, promote sustainable development, and to reduce deforestation by enhancing forest resilience to climate change, all with integrated approach to rural development. This strategy also aims to increase carbon stocks by reducing emissions of 170MtCO2/per year until 2030, a very ambitious, but fully committed goal that it is in line with Mozambique’s climate action plans. Governance: to emphasize coordination with cross-sectoral government institutions to reduce deforestation. Agriculture: to promote sustainable farming methods that will curb slash and burn activities and will increase productivity. Energy: to provide access to alternative sources of energy as an alternative to charcoal and wood fuels. Conservation: to strengthen the conservation area system and to find livelihood alternatives for local communities. Sustainable Forest Management: to promote forest concessions, community management and strengthen forest governance. Restoration of degraded areas and forest plantations: To establish a favorable environment for increasing forest plantations and forest businesses. The implementation of this strategy will be financed by the ongoing programs that the World Bank Group already has on the ground like the Forest Investment Project (MozFIP), the Dedicated Grant Mechanism for local communities (MozDGM), the Mozambique Conservation Areas for Biodiversity and Development Project (MozBio) and the Forest Carbon Partnership Facility (FCPF) through its Carbon Fund Project. “The government of Mozambique carefully designed its new strategy to help fulfill our commitments to the Paris Agreement, through its Nationally Determined Contribution - a collective action toward a low-carbon, climate-resilient future through its national policies. Furthermore, this strategy contributes to the international goals of the Bonn Challenge; a global effort to restore 150 million hectares of the world’s deforested and degraded land by 2020. We look forward to working with the World Bank Group and our other partners in the coming year to get this strategy into action,” said Momade Nemane, chief operating officer of the National Sustainable Development Fund, MITADER.